Marcona almonds, or the "Queen of Almonds," are imported from Spain. They are rounder, softer and sweeter than our California variety, with a delicate taste similar to almond extract. Although I’d given small tins of them for holiday gifts, I’d never tasted one. I’d been looking for an excuse to splurge on them, and this recipe from the Flavorwalla cookbook looked perfect. Worth the wait: they are delicious! So here’s your excuse - enjoy! 1. Slice off the top, bottom and sides of the orange to expose the flash. Cut the segments out of each membrane, catching the juice in a bowl below. Squeeze the juice from each segment. Set the segments aside. 2. Add the olive oil, vinegar, mustard, maple syrup, salt and pepper to the orange juice. Whisk to mix thoroughly. Set aside. 3. Tear the mizuna into bite sized pieces and put in a serving bowl. Tear off outer leaves of endive and slice inner leaves into 4-5 thin strips; put in bowl. Tear off outer leaves of radicchio and tear inner leaves into bite-sized pieces; put in bowl. Toss the greens together. 4. 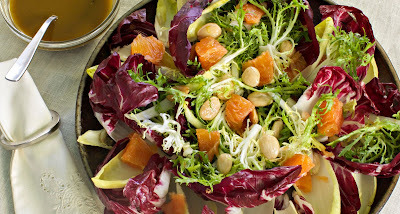 Add the almonds, shallot, and reserved orange segments to bowl. Toss to mix. 5. Mix the dressing well, and add to salad. Toss to coat thoroughly. Serve. *If you would like to toast the almonds. place almonds in an oven at 350 degrees F for 5-10 minutes; set aside to cool. I liked the taste of the almonds raw so did not toast them, but the recipe recommends it. Recipe adapted from The Flavorwalla Cookbook available here.